An unconventional way to find your passion? Perhaps, but it works. 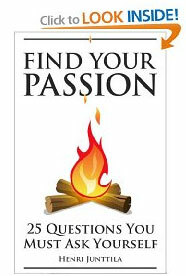 My book, Find Your Passion: 25 Questions You Must Ask Yourself, is finally here. It’s available exclusively on the Kindle on Amazon, but don’t worry, you don’t need a Kindle device to read it (more on this below). If you’re finally ready to find your passion, then read on, because I have quite a different take on this from most people. One of the biggest problems we run into is finding something that fulfills us and gives our life meaning. We go searching for the answer, and it’s right under your nose. You’re bombarded with so many different messages about discovering your passion that you forget to listen to yourself. And this book is all about diving into the depths of your being and discovering the right answers for you. 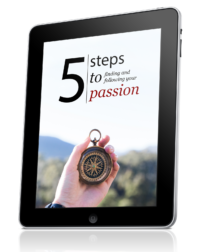 This is not just a bunch of advice, but questions that help you tap into your inner wisdom, and turn up the passion, purpose and meaning in your life. And yes, there’s a lot more. This book is a great deal at $2.99, but I still need your help to get reviews on Amazon. So once you’ve read the book, and if you like it, remember to leave a review on Amazon, because it helps other people find the book. This is extremely important. Leaving a review only takes a few minutes.So remember to leave a review once you’re done reading the book. The book is available in all Amazon stores. All you have to do is search for my name ‘henri junttila’ and you’ll find it. Thanks Patrik! I appreciate it. best of luck friend, I’m sure it will be a hit! Many blessings to you. Thank you, Annika. I appreciate it! I have the Mac Kindle reading thing but couldn’t figure out how to actually download it from Amazon – not intuitive at all over there!! Go to the book in Amazon, click on the Buy button to the right and once you’ve done that, it will show up in your Kindle application on your Mac once it has finished downloading. Just downloaded the book and am looking forward to reading it! Your work is always an inspiration Henri! Just downloaded and put on my reading list. Will come up with a review as soon I finish reading. And a thank you to you for that! Try using the Amazon UK link in the post. It is right under the US link. That should work! Yea finally out! I’m going to read this and leave a review as soon as I get some extra time. I will also put the link to the book on my site, on the interview post. It’s about time, eh? Thanks again for all the help, Navid. Just downloaded your new release on my Kindle and will be posting a review on it as soon as I’m done with it. Hi Henry! Thank you so much for sharing this book with us! As soon as I read it, I will certainly leave a review for you. Your inspiration is always just what I need! Thank you, Donna. You rock! Congrats Henri! know you will rock! I have no idea about the kindle app. Is it possible to download onto my desktop? Thanks Linoo! Absolutely, follow the links in the post. There’s a kindle app for both PC and Mac. And if you want to read it in your browser, check out the first link. Thank you for the opportunity Henri. I will read and leave a review by this weekend. You have always been a source of encouragement for me. i tried the link but sadly amazon informed that kindle version is not available in malaysia. Any help? Congrats on getting your book out there and I can’t wait to read it. And more importantly, I can’t wait to implement! I was able to get the book from Amazon however it didn’t go directly to my Kindle app. Its a tab. How do I make it go to my Kindle library? By the way, I love your simple to read blog and emails. The re-affirm that short and simple is best! Thanks for the kind words. I’m not sure, you may want to contact Amazon support on this. My only suggestion would be to double click on the book and see what happens. I’ve started reading your book and like you advice, writing down my ideas and thoughts based on the questions in the book. I try my best to really ponder over the questions, so I’m taking my time with the book. Actually my problem at the moment is that I’m not so sure what I actually want. Having made one dream come true I’m suddenly not sure what the next dream will be. That’s one reason I enjoy reading your blog, getting help with finding my passion. Actually I’m not that satisfied the way I spend my days at the moment and I’m facing graduation this year, have to finally decide what I’m going to do after all this studying 🙂 I know I need to do something that truly interests me, but just haven’t found my thing yet. I think I’m on the way to finding it, but it’s a journey. Congrats on your sales rank! The book is selling surprisingly well. It’s been to #8,000 early last week. I’m getting some fantastic feedback as well. Seeing how well you’re doing is making my fingers itch! I suppose tomorrow I’ll get to typing and maybe get my own book up there! Do it! Follow that itch.